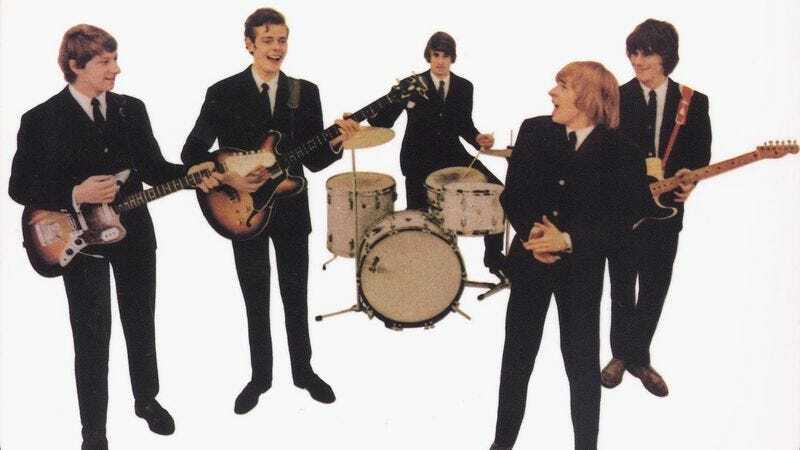 It’s hard to argue that The Yardbirds aren’t the most overshadowed “important” 1960s rock band. They were eclipsed in their own time by the commercial success and cultural impact of The Beatles and The Rolling Stones, and their legacy has been woefully obscured over the last several decades by the collective careers of its three guitarists: Eric Clapton, Jeff Beck, and Jimmy Page. People do talk about The Yardbirds—usually in the context of what was happening in Great Britain in the mid-1960s or as a prelude of what was to come—but they were far more than a preface project. One need only to listen to their sophomore studio effort Having A Rave Up With The Yardbirds to understand why. Having A Rave Up With The Yardbirds is probably the prime example of the sound of the British Blues movement that overwhelmed the city of London from about 1960 to 1966. It’s also happens to be one of the great collections of latent avant-garde, psych pop music that dominated the charts shortly thereafter. That diametrically opposed sensibility stems from the differing viewpoints of the two guitarists whose work stands as the focal point of this particular record: Eric Clapton and Jeff Beck. And actually, it’s that same difference of viewpoint that drove the former out of the group entirely, making way for the latter to come in and completely innovate the sound of the electric guitar. By the spring of 1965, Clapton had become entirely fed up with his bandmates. When he first joined The Yardbirds in 1963 they were a strict Blues band and that’s all that he was content to play. They cut their teeth early on performing late-night sets of Muddy Waters and Howlin’ Wolf covers at their manager Giorgio Gomelsky’s Crawdaddy Club in Richmond, and had even toured with the great harmonica player Sonny Boy Williamson II in ’63 and cut a live record with him. Then The Beatles happened, and then The Rolling Stones happened, and suddenly it became clear to the rest of The Yardbirds that there was a real viability in pursuing a more pop and world music influenced sound. Unfortunately for Clapton, that now meant that he was faced with the prospect of following the rest of the band down what felt to him like a gimmick, a musical rabbit hole that he had no intention of pursuing. The final straw for Clapton was the single “For Your Love.” With its harpsichord accents and bongo rhythms, it was about as far away from the blues as one could imagine at the time. “When The Yardbirds decided to record ‘For Your Love,’ I knew that was the beginning of the end for me,” Clapton wrote in his autobiography. “I didn’t see how we could make a record like that and stay as we were. It felt to me that we had completely sold out.” He quit the group on March 25, 1965, the same day the single was released to the larger public. Even without one of the greatest guitarist on the scene in the fold—worshiping fans didn’t scrawl the phrase “Clapton is God” on park benches and tube stations for nothing—the band decided to soldier on and cast a wide net for a replacement. At one point they approached Jimmy Page, who was working as one of the most prolific session guitarists on the scene, having built up a sizable reputation for his contributions to The Kinks and The Who. He turned them down flat, but not after recommending a friend of his named Jeff Beck for the gig. When Gomelsky phoned Beck, who was working as a car paint sprayer at the time, to see if he’d be interested in joining the band, he eagerly accepted the invitation. Jeff Beck was everything that Eric Clapton wasn’t. Where Clapton was a traditionalist, Beck seemed completely intent on pushing his sound to the absolute limit. To achieve this end, he employed the use of a Binson Echorec unit to create artificial echo and reverb sounds and turned to his friend Roger Mayer, a former engineer for the British Admiralty, to design a device that would help him sustain sound. Thus he became one of the earliest adopters of the fuzz pedal, which not only stretched out notes, but added a distinct-sounding layer of overdrive that later became the signature of both psych and garage rock. Almost immediately after Beck joined the group, the Yardbirds took off for a fall tour of the United States. “For Your Love” had been a huge hit for the band, going all the way to No. 1 on the U.K. singles charts, and reaching No. 6 in America. The demand was high for some in-person shows. Looking to capitalize doubly on that success as quickly as possible, the band also booked a number of recording dates while on the road in the U.S. In Memphis, they linked up with legendary Sun Records label head Sam Phillips and recorded two tracks, “The Train Kept-A-Rollin’” and “You’re A Better Man Than I” on September 12, 1965. A week later they found themselves in Chicago, where they stopped by the epicenter of that city’s famed blues scene, Chess Records, and laid down a rather appropriate cover of the Bo Diddley song “I’m A Man.” Eventually, they took the tapes of all three songs with them to New York City and punched them up at Columbia Recording Studios. Of those three songs, “The Train Kept-A-Rollin’” went on to be one of The Yardbirds’ most recognized hits; a veritable anthem that could be heard blaring out from behind closed garage doors across America in the years to come. Originally recorded by Tiny Bradshaw in 1951 as a boogie-woogie jazz standard piece, in the hands of The Yardbirds the tune was transformed into a galloping, harmonica-inflected, tour de force of electric guitar wailing. The song opens with a simulated train whistle from Beck’s trusted Fender Esquire before kicking into an almost hypnotic, chugging clip with wave after wave of guitar solos slamming into the speaker. It was entirely unhinged and gave a new sound and attitude for fledgling young rockers, like those in Aerosmith and Alice Cooper, something to aspire toward. Three tracks does not a record make, however, and once The Yardbirds concluded their American tour they reassembled at a variety of studios in London to cut the rest of the material for the next release. Among these were the Indian inspired “Heart Full Of Soul”—that’s not a sitar on this song, but rather Beck’s own guitar that he modified to approximate the sound of one; “Evil Hearted You,” which features an inspired Ventures-style guitar solo from Beck; and the lone original song on the entire record, the dirge-like “Still I’m Sad,” written by bassist Paul Samwell-Smith and drummer Jim McCarty. Everyone agreed that what they had in the can all sounded fresh, exciting, and contained just the right kind of eclecticism to propel them back to the top of the charts. The only catch was that six songs still wasn’t enough for a full album and the clock was ticking. Pressed to the wall, the band and its manager decided that the best course of action would be to include four tracks from a live show that they had performed with Eric Clapton the year before at the Crawdaddy Club to fill out the LP’s second side. It was a compromise, but as far as compromises go, it was an inspired one. The four songs that the band chose to throw onto the album included a cover of Howlin’ Wolf’s signature tune “Smokestack Lighting,” The Isley Brothers’ “Respectable,” and two Bo Diddley songs, “Here ’Tis,” and another version of “I’m A Man.” In a bit of a twist, all of these tracks actually appeared on its U.K. debut album Five Live Yardbirds. It can only be presumed that by adding this collection of material it was the group’s goal to introduce American audiences to its earlier signature blues sound. Because they used recycled material that had already been issued as singles in their home country, Having A Rave Up With The Yardbirds did not receive a U.K. release. It’s an interesting exercise to listen to both versions of “I’m A Man” back-to-back to get a sense of the natural predilections and style of each of the group’s two guitar players up to that point. Being that it was cut live, the version with Clapton on six-string lead is the more raved up take of the two, but even then, a lot of the mania is derived from lead singer Keith Relf’s dynamic harmonica play. However the moment that Clapton bursts out to the front with the warp speed chucka-chucka chord play is absolutely thrilling. The studio version is miles away more controlled and finds Beck playing his own game of call-and-response until he can’t match himself anymore and devolves into a maelstrom of screeching and scratching noises scrapped out from against his guitar strings. Same playbook, different plays. Things moved fast when you were a rock or pop group in the ’60s and just a few months after Rave Up hit the shelves, The Yardbirds were already ensconced in Advision Studios in London working on their even more out-there follow-up album titled either Roger The Engineer or Over, Under, Sideways, Down depending on who you ask. For his part, Clapton was working with singer John Mayall on the album Bluesbreakers With Eric Clapton that all but defined the overall aesthetic of blues-rock for generations to come. Beck and Clapton continued to explore entirely opposite directions and did so in a way that shaped the sounds of those around them, and the sounds from those who came after. Both of their influences should come as no surprise after listening to Having A Rave Up With The Yardbirds.